USS Yorktown (CV-5) stopped and making repairs after three bomb hits from Aichi D3A Type 99 (Allied code name "Val") dive bombers scored three hits on June 4, 1942. At 1420 Hours, three bombs hit the ship. One D3A exploded just as her bomb dropped, the bomb tumbling into the flight deck, causing casualties to the crews of the 1.1-inch (28-millimeter) antiaircraft guns and sending hot fragments into the fueled and armed Douglas SBD Dauntless dive bombers on the hangar deck. The sprinklers were tripped and prevented the planes from exploding. The second bomb hit the smokestack, extinguishing all but number one boiler and damaging five of them; her men stayed at their posts, despite the toxic fumes building up in the heat. The third bomb pierced the starboard flight deck at number one elevator and exploded in the rag storage space, near the forward gasoline storage. The system was flooded with carbon dioxide, which prevented a catastrophic explosion. By 1440, Yorktown was dead in the water. It took an hour to fix the boilers and by 1550 she could make twenty knots (37 kilometers/hour). The fires were under control, repairs were effected to the flight deck and she began to fuel planes for takeoff. At 1600 the Nakajima B5N2 (Allied code name Kate) torpedo planes began to attack. 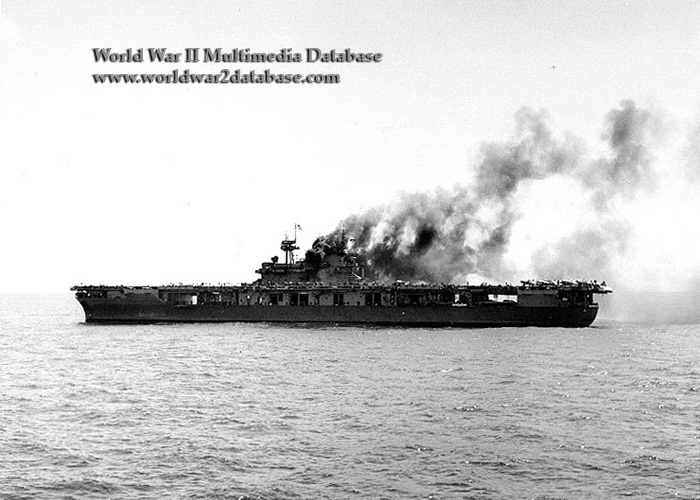 Yorktown launched ten fighters, most with only 23 gallons (87 liters) of gasoline. The Combat Air Patrol downed three; despite a heavy antiaircraft barrage, two torpedoes struck Yorktown, stopping her once more. The returning Kates reported that they had attacked a different carrier; Rear Admiral Tamon Yamaguchi believed the odds were now one carrier for each side. Actually, USS Enterprise (CV-6) and USS Hornet (CV-8) were preparing an attack on IJN Hiryu, the last Japanese carrier.